The BOXmover GmbH which was founded in 2004 by Dipl.-Ing. Rudolf Hubauer provides technical concepts as well as innovative products in the area of ​​heavy-duty, storage and handling technology. Optimization of the logistics chain requires individualization. This sets BOXmover GmbH apart from its competitors. Benefit from the BOXmover technology and the resulting cost advantage in logistics compared to the existing status quo. You want to escape the spatial and temporal constraints of the logistics chain? 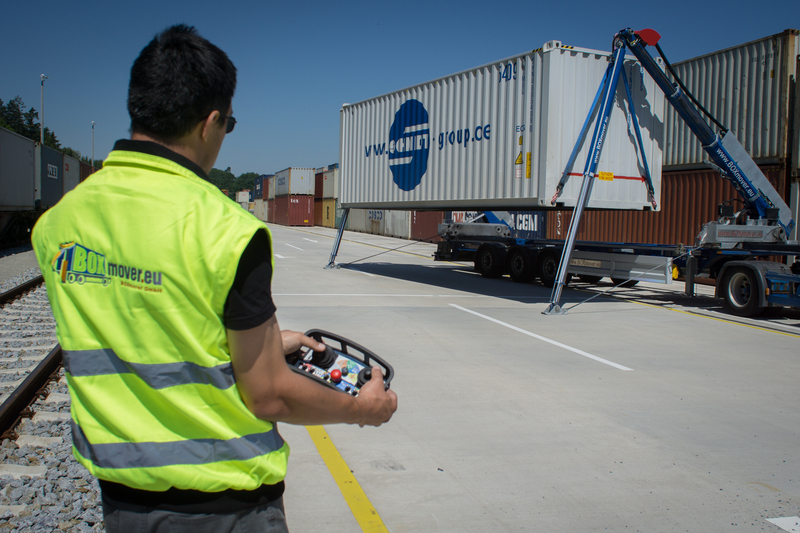 Then become a BOXmover and benefit from the BOXmover container handling technology! This is an innovative side loader concept, which only uses the lower four standard corner fittings of the loading unit as reference points. This allows you to handle all ISO containers, swap bodies, SWAP body tank containers and individual solutions worldwide without any spatial or temporal dependencies. You can thus handle standardized loading units on the road, in rail transport and in combined cargo traffic. This innovative BOXmover side loader construction is mounted on the truck chassis and stands out from other handling solutions due to its low weight. In order to be able to offer you the most efficient solution, BOXmover GmbH designs special adapters for your loading units. This allows us to carry out the transshipment according to the standards. Use the BOXmover tipping container in agriculture, on the factory premises or as a mobile storage facility while the truck is already in use somewhere else. Nutzen Sie den BOXmover Kipp-Container für ihre Schüttgutlogistik. Dadurch profitieren Sie von bestehenden ISO-20ft Umschlagsystemen in Terminals oder Eisenbahnwaggons, sowie dem weit verbreiteten Hackenliftsystemen. Nutzen Sie die entstehende Flexibilität aus LKW- und Bahnverkehr mit Hilfe der BOXmover Technologie. In order to provide a well-rounded product portfolio, BOXmover GmbH in cooperation with its partner Scheuwimmer Fahrzeugbau GmbH offers a BOXmover trailer and a BOXmover chassis. In doing so we not only guarantee an envelope according to the standards but also customer-specific solutions. BOXmover GmbH wants to be your system provider and cross-industry logistics solution provider. The BOXmover development vision is characterized by the symbiosis of the cooperation between BOXmover GmbH and Scheuwimmer Fahrzeugbau GmbH. Innovative, pioneering and future-oriented solutions become reality for you. These ensure a clear constructive, functional and manufacturing advantage over the status quo. Do not miss any innovative and individual application possibility of the new and cost-saving logistics! Act and dare with us the step to become an innovative BOXmover!